What happens when a baserunner pushes a base out of position? We nearly found out in Miami Saturday afternoon when Chicago's Kris Bryant spun third base out of alignment. With one out and one on (R2), Cubs batter Anthony Rizzo hit a fly ball to Marlins center fielder Ichiro Suzuki, who caught the fly and threw to third baseman Martin Prado as Cubs baserunner R2 Kris Bryant slid into third base. Replays indicate that Bryant overslid the bag, and is inconclusive as to whether Prado's glove touched Bryant's right hand while it was off of the base, 3B Umpire DJ Reyburn's call of "safe" stood. Rule 2.03, The Bases: "First, second and third bases shall be marked by white canvas or rubber-covered bags, securely attached to the ground as indicated in Diagram 2. The first and third base bags shall be entirely within the infield. The second base bag shall be centered on second base. The bags shall be 15 inches square, not less than three nor more than five inches thick, and filled with soft material." Rule 5.09(b)(4), The runner is out when: "He is tagged, when the ball is alive, while off his base. 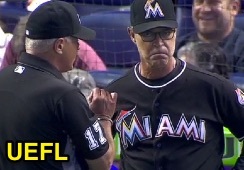 APPROVED RULING: (A) If the impact of a runner breaks a base loose from its position, no play can be made on that runner at that base if he had reached the base safely." APPROVED RULING: (B) If a base is dislodged from its position during a play, any following runner on the same play shall be considered as touching or occupying the base if, in the umpire’s judgment, he touches or occupies the point marked by the dislodged bag." Thus, we have an interesting situation: Bryant's attempt at retouching the base did appear to displace or dislodge the base from its position (though it didn't "break loose" outright, as in the center of the base appeared to remain secure to the ground: the stake simply appeared to rotate in its underground socket). Second, Bryant, by virtue of his momentum in sliding past the base, did not necessarily "reach the base safely," as in 5.09(b)(4) AR (A), but possibly did occupy the point marked by "the dislodged bag," as in AR (B). Note that (B) applies to a following runner, though if, in the umpire's judgment, Bryant touched or occupied the point marked by the dislodged bag, he may be declared safe. 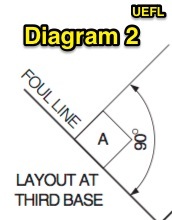 This is a judgment call, though bear in mind, pursuant to Diagram 2, the bases are intended to be stationary and flush with the foul lines.